Fight for your Faction! Control the Galaxy! 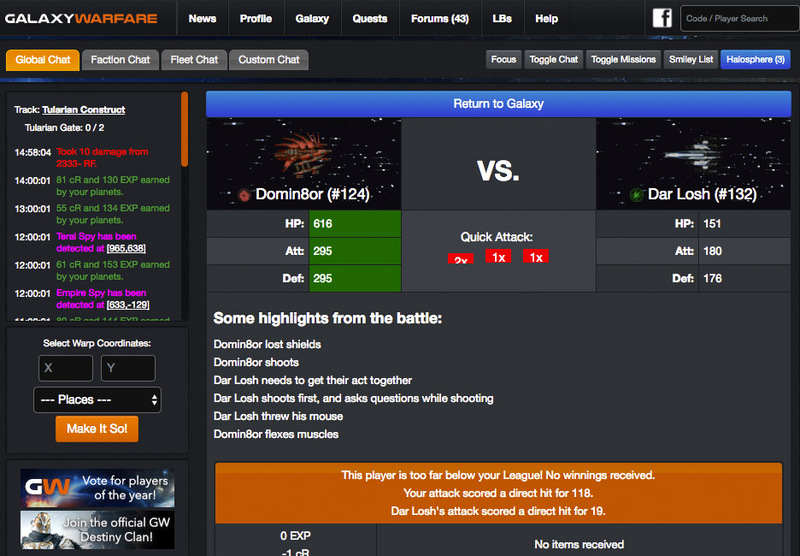 Galaxy Warfare is a grid-based space exploration and combat game. It is simple to play, but difficult to master. Players each control a ship and are free to explore a X,Y based galaxy, with planets, resources and mysteries. 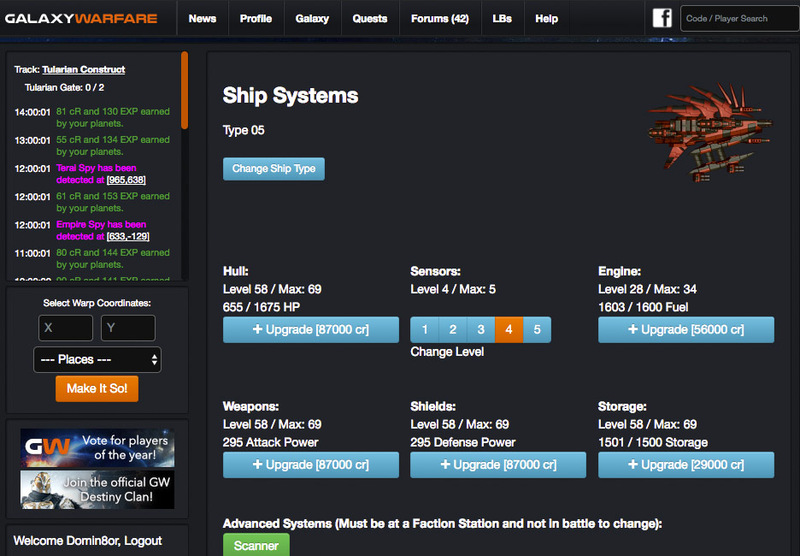 Players also engage in combat, form fleets, enhance their ship and systems and fight to control the galaxy. Humans and Terai have long been at war. Out of the ruin of Earth came the Earth Empire, a force struggling to maintain control of the Galaxy and it's resources. The Terai, a brutal alien race continue to expand their power. Between the two arose the Vile Rogues, a faction of those who are disobedient and careless of the ways of the other races. An ancient civilization known as the Tularians hold the key to unlocking the secret of a great energy source, but which faction will find and control this energy and win the war? 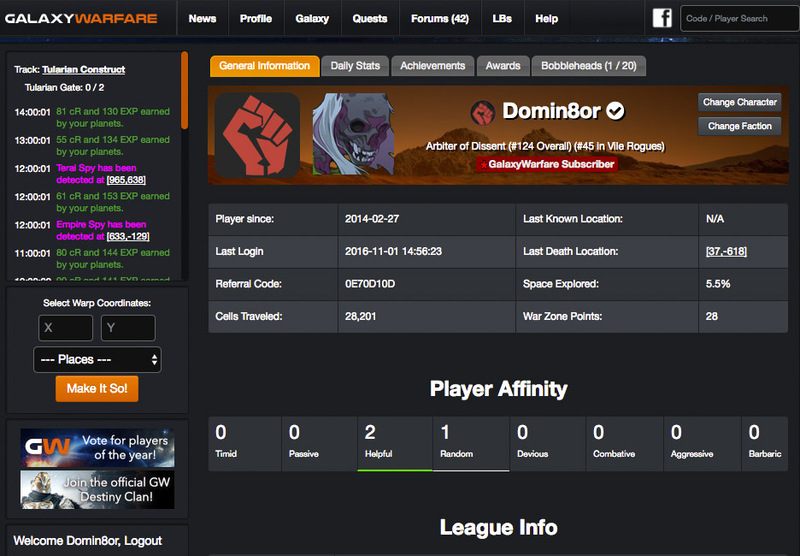 Galaxy Warfare is made up of a large, active, passionate community of gamers from all over the world. We are extremely proud of the community of players we have and actively seek their feedback and guidance as the game evolves. 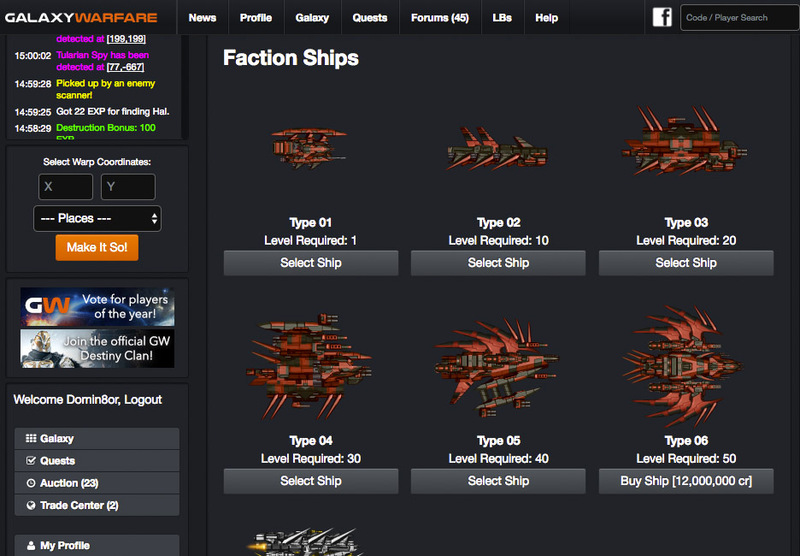 Galaxy Warfare receives updates just about every week as well and we try to run community events monthly or more. HBunny here, and I'm eggcited as anything to unveil this year's Egg Hunt. Similar to previous years, this open-community contest is based on the concept of players searching aggressively for Easter Eggs hidden in the Galaxy with the goal of finding the Golden Egg, with Prize incentives. However, this year I've switched things up a little bit. So, let's dive into the mechanics of the event. There are 6 eggs hidden in the FIRST QUADRANT. By condensing the playing field, competition will be much more intense. Each Egg contains an "Eggshell Fragment" clue to the next, as well as some Egg Whites. An additional Golden Egg is hidden somewhere off-grid. The clue to find this Egg is hidden within the clues found in the 6 initial Eggs. Combine all Eggshell Fragments with other items and the items found in the Golden Egg to make your own EGG SUPREME, which will grant some nice Credits and EXP. This year, an additional BONUS EGG is hidden in an undisclosed location. NO hints will be provided as to this area, at least to start. If you find the BONUS EGG you can combine its items with an EGG SUPREME as well as other undisclosed items to create an EGG SUPREMEST. This "upgraded egg" can be deconstructed for some really, really nice items. ONE: The first person to find the Golden Egg is entitled to three nice items stored within the egg. FOUR: Anyone who collects all 6 Eggshell Fragments and sends me a screenshot of them will receive an Egg Hunter award, unless you have it from previous years. Be on the watch for other Event happenings! HAL has turned into RABBIT 9000. Ugh. Also, expect a huge EXP buff on Easter Sunday! Oh, and one thing to keep in mind: If you're certain you're near the location of a clue, don't give up. Eggs are near, but not EXACTLY, at the locations of their listing. This is especially applicable for the Golden and Bonus eggs. A lot has happened around here recently. Anyway... I've been encouraged by the rapidly increasing activity levels (and somewhat player retention as well) possibly due to the re-launch of the GW Android app. I have decided to hold a competition, of sorts. The competitors are the collective Players of GW versus its Activity count and Cohort Analysis (indicative of player retention). If GW can reach BOTH 180 active players and 30% retention, I will add one semi-major feature to the game of the community's choosing, and as such, increment it to 4.1.1. As a reference point, we currently have 134 active players and 20.54% retention. The good thing is, you all can't lose! This contest will run indefinitely, or at least until we hit that milestone. A forum post made by myself will be made following the victory to discuss what should be added. Good luck, get out there and tell your friends! This is not an endorsement of alter accounts. Same-IP / email / device / location accounts are being monitored more closely than ever. Christmas is over! Sorry it took me this long to get the totals & post up. 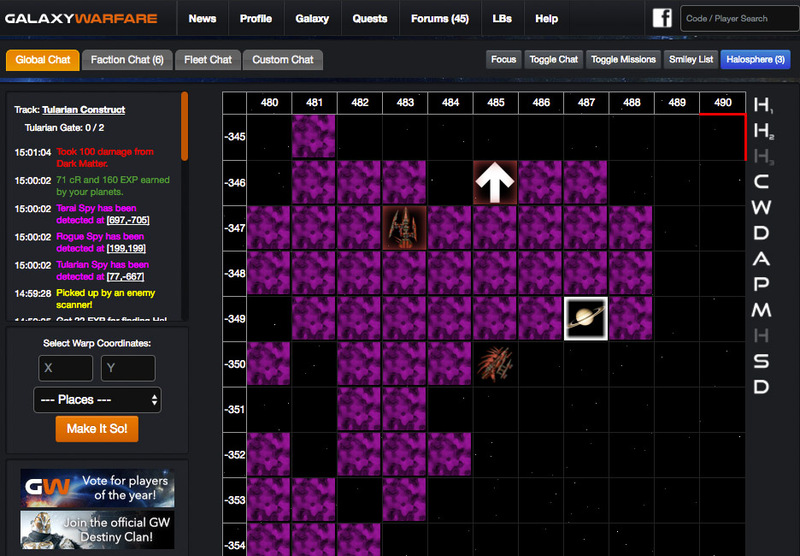 Congrats to Angamaite for taking the cake on this one! The redemption rate for Ornaments will be 1000 per fragment, unless the requested Fragment(s) are of your own faction, in which case they'll be exchanged at 2,500 per. If you're listed above, please message me with your desired Fragments within a week. All leftover Ornaments will be converted to Credits deposited into your account at a rate of 4,000 per. Edit: If you have less than 1000 Ornaments, you can redeem 500 for a Photon Sphere and Credit Megasphere combo. Once again, let's give Angamaite a hearty congrats. Since they won both categories, as stated in the original post, the Ornaments category prize falls to the second place winner; Garadexx! I will give out the Multiplexic Techs with the Fragment redemption upon PM. Remember to send me those messages! Ornaments will be gone in ONE WEEK. That's Saturday, the 19th. 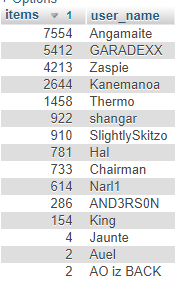 How did Gara win second place? Shouldn’t zaspie claim second for planets claimed? 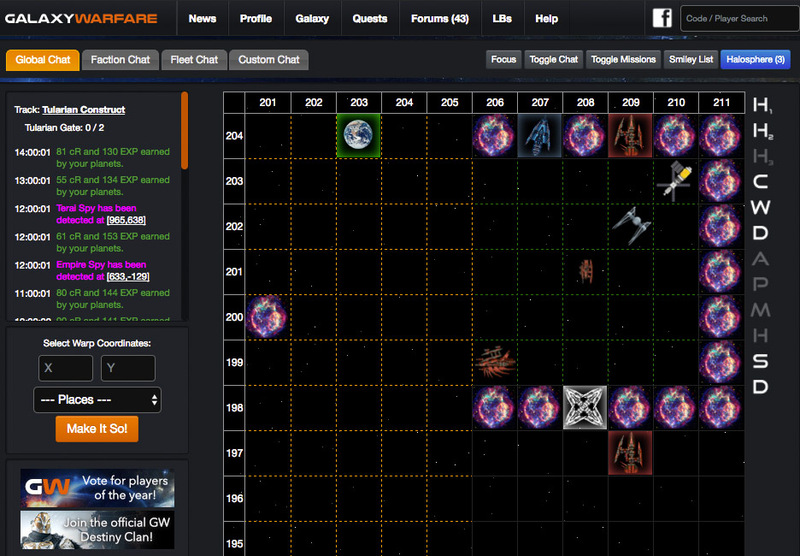 Note that the virus targets the Faction and players with the most planets the hardest! It will also strike proportionally to the amount of players online at any given time, but will only spread if 6 or more people are online. Also, you will take damage from landing on viral Christmas Tree-planets, so be careful! Ornaments give 1 Credit and 1 Fuel, but drains 1 Health on use. Use it in bulk, or save it for the end of the event for trade-ins! + HAL is Santa again. Uh oh. + We put up some decorations. Enjoy them while they last! You may need to do a full (cache) refresh on Desktop to see everything. + 1.25 EXP running until the event's conclusion. 2.5 EXP on Christmas day! + Watch out for Santa and/or his Reindeer! + January Voting is live! At long last, I have totaled the Halloween event and decided a path moving forward. I think Zaspie has a little too much time on-hand. Since things didn't work out as planned, I've had to retroactively adjust what would be considered appropriate prizes. Candy Corn will be redeemable at 2000 per Fragment, HOWEVER: if the Fragment(s) of choosing is/are that of your own faction, it will be a deductible of 5000, rather than 2000. Zaspie will also be the lucky recipient of the promised Multiplexic technology. If you're listed above, please message me with your desired Fragments within a week. All leftover Candy Corn will be converted to Credits deposited into your account at a rate of 5,000 per. Obviously, this is the more difficult scoring to handle. For some, it worked half the time. For others, key binds were the solution. Mobile players were entirely unable to revive planets. I apologize sincerely for this. It caused many days of consternation on my part, and I was only able to find the root of the problem thanks to some insight from Skitzo. As a result of all the mediocrity and disparity on the playing field, I cannot award any prizes for scores in this regard. Sorry! 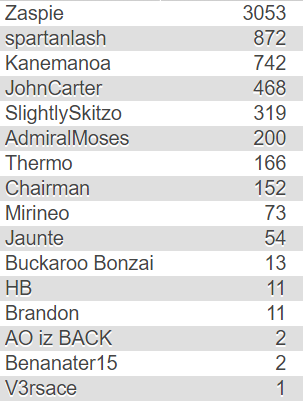 However, here's the totals for lolz. Once again, let's give Zaspie a round of applause. Goodness gracious! Remember to send me those messages! Candy Corn will be gone in ONE WEEK. That's Thursday, the 6th. The Planetary Plague has hit the Galaxy! Every minute, planets everywhere are being targeted seemingly at random by an Infection that turns them into giant Jack-o-Lanterns! You can acquire loads of Candy Corn from these Infected planets, or Revive them to claim them and turn them back to normal. At the conclusion of the event, in a week or so, two winners will be selected as follows: the person with the most Candy Corn, and the person who has Reanimated/Revived the most Planets. Winners will receive a Multiplexic Technology for each category won. Also, you'll be able to exchange 2000 Candy Corn for a Fragment of your choice at the conclusion of the event. Note that the Infection targets the Faction and players with the most planets the hardest! It will also strike proportionally to the amount of players online at any given time, but will only spread if 6 or more people are online. Also, you will take damage from landing on Infected Planets / Jack-o-Lanters, so be careful! Candy Corn gives 1 Credit and 1 Fuel, but drains 1 Health on use. Use it in bulk, or save it for the end of the event for trade-ins! Well, thankfully, we're not going back to that. However, I will be steadily introducing a few more bots to the grid. The main goal here is to provide more combat opportunities, especially for newcomers. The amount of bots and the quality of their loot will be a bit of a work in progress. They will initially be stocked with items but those loot pools may be adjusted as we go. Please feel free to provide constructive feedback on them—as the process rolls along, I'm happy to adjust things as needed. A thread titled "New Bots" has been created in the Feedback forum. Please post any feedback there. Good to see you back, and if you're new, Welcome! A lot has been added, removed, and drastically changed in this update. Everything from quests, to missions, to bots, to items, to the grid itself has been remade, all by hand. While a lot of work went into this update, it was also done under a time constraint- because of the nature of its release, I did not have time to properly evaluate how all of the new data will influence the game. As a result, you all will be the lucky few who get to witness first hand GW in its second coming, and participate in molding it into what it'll become in the following years, as GW2 is developed in the shadows behind the scenes (potentially releasing in Alpha as early as the first quarter of 2019). In your role as stewards of a reborn game, you're endowed with much responsibility. I need your support in providing feedback that will suit not your own needs, but the needs of the game as a whole. I also need your patience as we release balances, updates, patches, and other things from this release. Right off the bat, I need you to be aware of a few large changes we have made. Whether some of these will be permanent or not remains to be seen. + EVERYONE has been reset to square one. Only your Awards remain. + Umir Gate / Queen / Technology has been removed. Umir Tech is now Multiplexic Tech. Swarm still exists. + Subscription Status has been removed for everyone until I get a list of who is still actually paying. Thank you for your patience! I'm sure I missed something here, and even if I listed everything I could remember, it would take me a few days to write and equally as long for you to read. Seriously, a LOT changed. I'll try to add any major things that I remember. There's also a few things I had wanted to do in this release, but haven't gotten to quite yet. I WILL accomplish these, but not until 4.1.0, whenever that will be. I have created a Forum for discussing V4.0.0 changes and such. Please stay civil and provide constructive criticism only. Thank you. Also... We will not have any Weekly or Monthly missions until Sunday and Next Wednesday, respectively. On that same note, August Governors will be volunteer Staff members. Voting will resume as normal in mid-August. I would like to give a massive Thank-You not only to the playerbase for your overwhelming support and patience, but to a few select people who I couldn't have done this without. 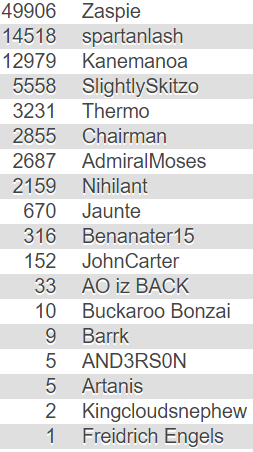 SlightlySkitzo, SomerandomStickboy, Benanater15, Mahvl, Thermo, and the rest of Staff- you have all been more helpful and supportive than I could have ever wished for. Thank you. I really can't thank you enough. I'd also like to give a shoutout to an IRL friend who I'll simply call "Classycoder" for staying up with me until 3 AM one night entering item values. Without these people, you wouldn't be able to play for at least another week. Here's to a game reborn, and its awesome future! Now go get claimin'!